Instructional design consultations include writing outcomes, designing activities, aligning assessments with outcomes, and implementing teaching methods and pedagogies for your course. Faculty, course coordinators, and instructors can contact our instructional designers and ask to set up a consultation by emailing vetmet-edusupport@ncsu.edu. During the consultation, the instructional designers collect and analyze the faculty’s ideas. The instructional designers then research and collect evidence for suitable instructional strategies, pedagogies, technology uses and design implementations for course activities. The instructional designer will contact the faculty to meet and discuss the best practices and how to apply it toward revising their course teaching and technology use. 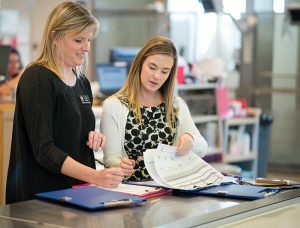 Course design starts after faculty have consulted with an instructional designer and understand the process of rebuilding their course, which is not limited to classroom teaching. If the faculty agrees to pursue the revision, the instructional designer will request a series of meetings to plan course design. The instructional designer confirms agreement with the faculty and begins to design the course. When the design is done, the instructional designer presents the finished course design to the faculty and receives feedback. Instructional design consultation for Moodle course management and testing design in conjunction with course content are also done within our instructional design team. The ESS team can assist faculty with all things Moodle – from providing templates designed to help students better navigate their courses to creating course content to help students understand learning outcomes. Instructional designers can also provide guidance regarding how to implement practices in Moodle to elevate student outcomes and provide training on how to incorporate features in Moodle to an instructor’s advantage. For additional information regarding best practices in Moodle and other applications, visit our Tools page. Faculty can contact ESS to schedule a Moodle course redesign at vetmed-edusupport@ncsu.edu.